There’s that moment in a rehearsal when, all of the sudden, everyone, to put it simply, gets it. These seemingly ephemeral moments stay with us for years at a time, and often are the reasons why we play classical music. These moments only come when every single person of the group is physically and mentally involved, giving everything they have for that one second of time. It is more than just playing closely to the dynamics, or playing perfectly together another section. It is about diving into one’s own introspective and truly feeling the piece. “Look up,” exclaimed Mr. Zander, “eyes on me and be aware of everyone else’s sound around you.” That’s when it happened. We were working on Beethoven’s Egmont Overture, closer to the beginning of the piece. I can recall not only looking up and seeing the difference, but also hearing it. The orchestra became one musical entity, with all the voices beautifully coming together in the masterpiece that is Beethoven’s Egmont. To think this effect is magnified in a concert setting builds the excitement even more. Many people ask, that if we sound this wonderful on the second rehearsal, how we shall sound in November after having a dozen rehearsals and sectionals, let alone the tour nearly nine months away. 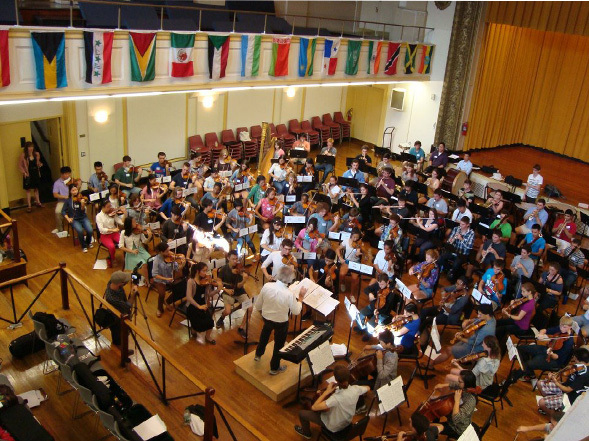 Indeed, the first few Boston Philharmonic Youth Orchestra (BPYO) rehearsals showed more than just promise for such a special ensemble of young people. Not only did the orchestra have no trouble capturing the heroic spirit of Ein Heldenleben, but many of the deemed impossible passages were plowed through like a practiced study. The lengthy excerpts did their job, as half of the famous The Hero’s Battle section was learned. At the famous return of the theme at rehearsal 77, the orchestra was so passionate that I forgot to come in after we finished the section. During all of this, many people came in off the streets through the open doors to hear Strauss’ masterpiece. I counted at least 15 extra people listening in on the inaugural rehearsal of the Boston Philharmonic Youth Orchestra. I noticed to or three of them stuck around for at least an hour until the rehearsal was finished. The orchestra being comprised of about half college players and half high school players has a bar that is set very high. Not only are we expected to learn our notes and rhythms by each rehearsal, but we are also expected to dig so much deeper than any normal orchestra, not because of the way we play our instruments, but because we are young. As young people, we have the privilege of experiencing much of this music for the first time. I don’t believe a single person in the orchestra has ever played Ein Heldenleben before, and the sheer excitement of attempting such a piece is enough to bring a wave of passion that makes each of our concerts special. This is what makes BPYO an extraordinary youth orchestra, and in the end, this is what I believe will bring about our ultimate success. Perhaps the best part of it all was when we walked out of the hall on rehearsal break, and saw a table of food beautifully prepared for us. Food during break? Fantastic! You can find a video of highlights from the first rehearsal here. thanks for sharing! you guys rock!